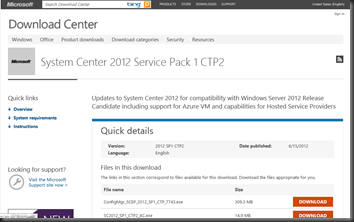 On the Server & Cloud blog, the System Center team announced that the second Community Technology Preview (CTP2) of System Center Service Pack 1 as being available for download. The System Center 2012 SP1 update enables System Center to run on and manage the Windows Server 2012 Release Candidate. System Center 2012 SP1 scales management to complement the scaling in Windows Server and also adds System Center manageability to the new capabilities in Windows Server 2012 such as virtual networking. Move on-premise virtual machines to Azure using App Controller. Manage Azure virtual machines from your on-premises System Center using App Controller and Orchestrator using the new Azure Integration Pack. A new cloud enabled capability called “Global Service Monitor” (GSM) extends the application monitoring in System Center 2012 to enable you to add “outside-in” testing to incorporate a true reflection of users’ experience of your web site or web application. Through the System Center 2012 Operations Manager console you schedule the GSM cloud service, hosted in Windows Azure, to issue synthetic transactions against your web facing application from Azure points of present around the globe. GSM reports back the results (availability, performance, functionality) to your on-premises operations manager dashboard. You can integrate this perspective with other monitoring data from the same application, taking action as soon as any issues are detected in order to achieve your SLA. To evaluate System Center 2012 SP1 with GSM, sign up for the customer preview of GSM. System Center 2012 helps you optimize your organization’s use of both private cloud and Windows Azure resources through the App Controller component. System Center 2012 SP1 extends App Controller’s capabilities to include cloud resources offered by Hosting Service Providers, giving you the option of consuming a wide range of custom and commodity IaaS cloud services from your Service Provider. For Service Providers, System Center 2012 SP1 adds the new “Service Provider Foundation” (SPF) API. SPF is an extensible OData REST API that can be easily integrated with the hoster’s customer portal and is automatically integrated with customers’ on-premises App Controller. A simple exchange of credentials enables enterprises to add the Service Provider cloud to App Controller for consumption alongside private and public cloud resources. SPF also has multi-tenancy built-in and can operate at massive scale, controlling multiple scale-units built around Virtual Machine Manager. Microsoft Forefront Threat Management Gateway 2010 Service Pack 2 is now available for download. The new Site Activity report displays a report showing the data transfer between users and specific websites for any user. A new look and feel has been created for error pages. Error pages can be more easily customized and can include embedded objects. You can now use Kerberos authentication when you deploy an array using network load balancing (NLB). To read the release notes, see the Forefront TMG Release Notes (SP2). This is a repost from the TMG Team Blog. Microsoft® Forefront Threat Management Gateway (TMG) 2010 Service Pack 1 (SP1) got released on 23rd June 2010. Microsoft® Forefront Threat Management Gateway (TMG) 2010 Service Pack 1 (SP1) introduces following new features and functionality to Forefront TMG 2010 Standard and Enterprise Editions. The new User Activity report displays the sites and site categories accessed by any user. All Forefront TMG reports have a new look and feel. You can now allow users to override the access restriction on sites blocked by URL filtering. This allows for a more flexible web access policy, in that users can decide for themselves whether to access a blocked site. This is especially useful for websites that have been incorrectly categorized. You can now override the categorization of a URL on the enterprise level; the override is then effective for each enterprise-joined array. Denial notification pages can now be customized for your organization’s needs. Collocation of Forefront TMG and a domain controller on the same server, which can help reduce the total cost of ownership at branch offices. When installed on a computer running Windows Server 2008 R2, SP1 simplifies the deployment of Branch Cache at the branch office, using Forefront TMG as the Hosted Cache server. Forefront TMG SP1 supports secure publishing of SharePoint 2010. If you or your customers are running Windows Vista RTM version (without any service pack), please note that support for it has ended yesterday, April 13, 2010. To continue receiving support for Windows Vista, you must install Service Pack 1 or Service Pack2, which is available as a free download from the Microsoft Download Center. Follow this link, for information on how to obtain the latest service pack. We at Microsoft take product quality seriously and make every effort to avoid and resolve issues that adversely impact our customers. Unfortunately, a bug with MOSS 2o07 Service Pack 2 (SP2) has been discovered that affects all customers that have deployed it for SharePoint Server 2007. During the installation of SP2, a product expiration date is improperly activated. This means SharePoint will expire as though it was a trial installation 180 days after SP2 is deployed. The activation of the expiration date will not affect the normal function of SharePoint up until the expiration date passes. Furthermore, product expiration 180 days after SP2 installation will not affect customer’s data, configuration or application code but will render SharePoint inaccessible for end-users. Microsoft is working to release a hotfix to automatically fix this issue. A manual work-around is currently available and involves customers re-entering their Product ID number (PID) on the Convert License Type page in Central Administration. For more information and detailed steps please read this KB article. Microsoft wishes to assure their customers that this issue does not impact data integrity or their SharePoint deployment in any other way. The team apologizes for any inconvenience this issue may cause you. Which products are affected by this? Applying Service Pack 2 to any of the following products will result in this issue: Office SharePoint Server 2007, Project Server 2007, Form Server 2007, Search Server 2008 and Search Server 2008 Express. Windows SharePoint Services 3.0 is not affected by this issue. To work around this issue customers will need to re-enter their Product ID numbers (PID) on the Convert License Type page in Central Administration. Please see this KB article for detailed steps. Customers can also wait for the hotfix (available for free from http://support.microsoft.com) to resolve this issue. Product ID numbers (PIDs) can be retrieved by logging into the Volume Licensing Service Center. Note: For Search Server 2008 Express the only way to resolve this issue is to apply the hotfix. What is Microsoft doing to fix it? Microsoft is working on a hotfix and public update for the product. We will update this blog post with details and a link to the hotfix as soon as it is available. Do I need to update all of the servers in my farm? No. The Product ID number only needs to be entered once. What if I haven’t installed SP2 yet but want to? What should I do? Does this issue impact anything else? The issue only activates the product expiration date. The activation of the expiration date does not affect the normal function of SharePoint up until the expiration date passes, at which point SharePoint will be inaccessible for end-users. This issue does not affect customer’s data, configuration or application code. I can’t find/don’t know my original PID, where can I find it? Speeds up Outlook with Startup, Shutdown, Folder view and switch, and more! Outlook Search reliability – Improves search reliability when you use SP2 with Windows Desktop Search 4 (http://www.microsoft.com/windows/products/winfamily/desktopsearch/choose/windowssearch4.mspx) . Improves SharePoint sync functionality with OneNote. This helps reduce the load on SharePoint servers, and it helps produce fewer sync errors. Improves image quality after files are saved in the .jpeg, .png, and .gif formats. You can download Office 2007 SP2 from the Microsoft Download Center or get it installed via Windows Update. The 32-bit and 64-bit release candidate versions of Windows Vista Service Pack 2, and Windows Server 2008 SP2 are available for download on the Microsoft website. Provides Hyper-V as a fully integrated feature of WS08, including one free guest OS with WS08 Standard Edition, 4 free licenses with Enterprise Edition, and unlimited free licenses with Datacenter Edition. Service Pack 1 for System Center Data Protection Manager 2007 is now available for download. More information and download links are available here. ISA Server 2006 Service Pack 1 will be released tomorrow (Wed, July 2, 2008)on the Microsoft Download Center. From July 22, the service pack will be available through the Microsoft Update channel. This is a massive service pack with over 200 bug fixes and tons of new, visible features. One of the most notable features is the change tracking feature, which is a much-awaited and highly requested feature from customers. ISA 2006 now keeps track of all changes done to the configuration and helps you track your actions all the way back. The ISA admin’s life just got better. Configuration Change Tracking – explained above. Query on Diagnostic logging – For those who remember the ISA 2006 supportability pack – there was a diagnostic logging feature included. Now, SP1 adds a query feature on the diagnostic logging tool that helps you see only the log data relevant to the problem you are troubleshooting. PLUS tons of improvements to existing features like support for certificates with multiple SAN (Subject Alternative Names), Multicast support for integrated NLB, etc. I think this is really an exciting update as it contains much of the enhancements requested by customers. Microsoft is listening! Update: Here is the download link.